The Blasto coral is a favorite with great colors and subtle, but very unique characteristics! Blastomussa Corals come in amazing color combinations. The striking Blasto Coral Blastomussa wellsi is one of the two highly favored Blastomussa corals, with its close cousin the Pineapple Coral Blastomussa merleti, being the other. The Blasto Coral B. wellsi is generally considered more desirable than B. merleti due to its aquacultured colors that include green, purple, yellow, pink, red, sometimes even blue, and combinations of these colors. But it is also considered to be the more difficult of the two to care for. Some other names this coral is known for is Blastomussa Coral, Open Brain Coral, Wellsi's Brain, Swollen Brain Coral, Pineapple Coral, Big Pipe Blastomussa, and Blastomussa Wellsi. The Blasto Coral B. wellsi is a great coral and makes an excellent centerpiece for the aquarium. Though they are slow growers, they are easy to moderate to care for and easy to frag. If you forget to feed them, it's okay. They can be fed directly and that will make them grow faster, but they are also content to take nutrients from the water column. Provide moderate lighting along with moderate, turbid water movement. Strong light will prevent the polyps from opening fully and can cause it to recede. Too strong of a water flow will also cause the polyps to close, and will make it impossible to feed. Blastomussa corals have been rare in the industry due to their natural habitat. They are found in turbid waters on the lower reef slopes, making them rather difficult to collect. However many people have propagated these easy to grow large polyp stony (LPS) corals, so though still considered more rare, availability is much better today. They tend to be quite pricey, especially for the more exotic colors. The Blasto Coral, B. wellsi, is similar to other LPS when it comes to feeding. Typically anything larger than a grain of rice will be expelled. Sure, it LOOKS like your coral ate it, but it takes time for it to realized the food is too large and will take a while to expel the food. Meanwhile, you have walked away and thought it was all good! This video is a perfect example of what happens when our backs are turned! These corals come in amazing colors and command a high price! The reason they are so expensive! Blasto Corals, B. wellsi, are often 3 to 4 times more expensive than their small cousins, B. merleti. This video is one reason why! The aqua cultured specimens have an insanely wide range of colors and their larger fleshy polyps, which are 2ce as large as B. merleti, make for a fantastic display! They are moderate to keep, needing at least 29 gallons with moderate light and low turbulent water movement. Some retailers offer one polyp or a colony. Distribution / Background Blastomussa Coral Information: The Blastomussa genus was described by Wells in 1961. According to author Vernon in his book "Corals of Australia and the Indo-Pacific", there are three true species. However, there are 2 species that are officially recorded at this time and they are Blastomussa merleti and Blastomussa wellsi. Some of the names they are known for are Pineapple Coral, Open Brain Coral, Moon Coral, Blastos, Blastomussa, Wellsi, and Merleti. The B. wellsi was described by Wijsman-Best in 1973. Some common names these corals are know for are Blastomussa Coral, Open Brain Coral, Wellsi's Brain, Swollen Brain Coral, Pineapple Coral, Big Pipe Blastomussa, and Blastomussa Wellsi.The B. wellsi has been propagated in captivity with great success. Where Blastomussa Corals Are Found: The Blastomussa wellsi are found in New Caledonia and then around Australia in the Great Barrier Reef, Coral Sea, Elizabeth Island, Middleton Reefs, and the Houtman Abrolhos Islands. Blastomussa Coral Habitat: The Blastomussa wellsi live in turbid waters on lower reef slopes at depths from 0 - 131 feet (0 - 40 m). They feed at night, extending tentacles. Status The B. wellsi is not on the IUCN Red List of Endangered Species. Description What do Blastomussa Corals look like: The skeletal structure of B. wellsi starts from a common base and branches upward in a "dome" shape, thus contributing to the name Moon Coral. It has asymmetrical corallite branches that are 9 -14 mm. The polyps of fully developed specimens can reach up to 4 to 5" (10 - 13 cm) across. The structure and corallite branches are hidden when the polyps are fully expanded. Life span is unknown. In nature the Blasto Coral is found in two color morphs, dark red and green. Aquacultured colors can be much more diverse such as green, purple, yellow, pink, red and sometimes even blue. They have also have combinations of these colors. There are some easily identifiable differences between B. wellsi and B. merleti. The polyps on the Blasto Coral B. wellsi are nearly twice as large in diameter as those of its cousin. On B. wellsi they can reach up to 4 to 5" (10 - 13 cm) across while on B. Merleti the polyp can reach about 1 to 2" (2.5 - 5 cm). Both species branch, but the corallite branches on the Blasto Coral B. wellsi are closer together and much larger in diameter. It has asymmetrical corallites that are 9 -14 mm, while the corallites of the Pineapple Coral B. Merleti are less than 7 mm in diameter. The long tubular corallites of B. merleti are brittle and easily broken, making them easy to frag without damaging the mother colony. Difficulty of Care Blastomussa Coral Care: Like other Mussids, the B. wellsi is is easy to moderate to care for. It should be placed among the rock work, not on the sand. Provide a moderate light, as strong light will prevent the polyps from opening fully and cause it to recede. They need shade in tanks with Metal Halides, yet may possibly be slowly acclimated to MH. Water flow should be moderate and turbid as well. Strong water movement will also cause the polyps to close and will make it impossible to feed. Like other members of the Mussidae family, the polyps tentacles come out at night to feed. In captivity, B. wellsi does very well being fed zooplankton, mysis, cyclopeeze, and other very small minced shrimp or fish. Feeding several times a week can help them grow faster. Each polyp can be its own animal, so make sure you are feeding all the polyps. Be sure to have proper water movement and lighting. Provide moderate lighting and a low to moderate water flow for the best health. Provide shade when using metal halides, since the Blasto Coral will not fully open under lighting that is too strong. Strong water movement will also cause the polyps to close and will make it impossible to feed. This is an aggressive species, extending their sweeper tentacles at night. There needs to be plenty of space between it and other corals. Compatibility and Social Behaviors The Blastomussa genus is aggressive towards other corals. The B. wellsi will tolerate their same species, but they do need to be kept well away from other corals. They have tentacles that come out at night and sting nearby corals, but more than likely are the ones that will be over taken. The Blastomussa genus are hermaphrodites that use external fertilization in the wild. This genus reproduce asexually as well, using budding to propagate itself. In captivity, the B. wellsi can be propagated by fragmenting. Propagation is very easy. Taking care to have clean or gloved hands, simply use a bone cutter or strong scissors to cut off individual branches. Make sure the the newly fragged polyps have a low to moderate water flow to help them heal. Potential Problems The B. wellsi are attractive and durable when their needs are provided for. Turning brown or bleaching may be an indication that the light is to strong. Be careful to keep them free from mollusks, sponges and some sessile inverts, so the water flow between their branches is not restricted. 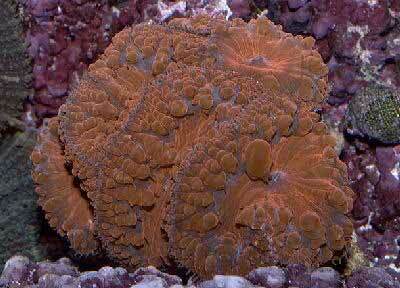 Availability Blastomussa Corals for Sale: The B. wellsi is very easy to find at pet shops and on line. The cost online varies, depending on retailer, size, and/or color. Prices can be about $70.00 USD and up for a single polyp, to well over $100.00 USD for a colony.